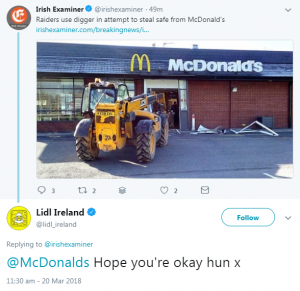 Lidl Ireland reaches out to McDonalds following Castletroy break in. 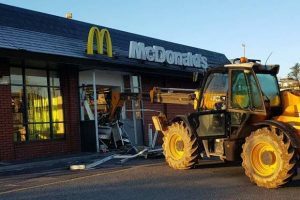 Gardaí are investigating after a JCB digger was used in a break-in at a McDonald’s in Limerick. The incident happened at approximately 2.50am this Tuesday morning March 20 at the McDonald’s at the Castletroy Shopping Centre on the Dublin Road. It’s also believed that the burglar/burglars managed to reach the safe and used the digger to drag it across the floor before abandoning their effort and leaving it behind. A photograph captured from a passer-by shows significant damage to the front of the premises, which is only a short walk from the University of Limerick. The restaurant remained closed this morning while a clean-up operation was undertaken. It is understood a substantial amount of damage was caused to the inside and outside of the McDonald’s outlet. Gardaí are currently examining CCTV security camera footage from the McDonald’s outlet and nearby premises in the shopping centre in a bid to identify the raiders. Anyone who was in the area at the time and who might have seen anything suspicious, is asked to contact Henry St station on 061 212400 . The scene is reminiscent of what happened during Storm Emma, on March 2nd, where a group of raiders used a JCB to gain access to a Lidl supermarket in Tallaght, Dublin. Following last night’s break-in, Lidl Ireland reached out to offer its support to McDonalds.